Big Sam watches over this East Texas recreational paradise. Gen. Sam Houston may have given his name to the big city down the road from Huntsville, but as I lay in my tent on the shores of Lake Raven in Huntsville State Park, it was pretty clear to me that he’d made the right choice to settle where he did. 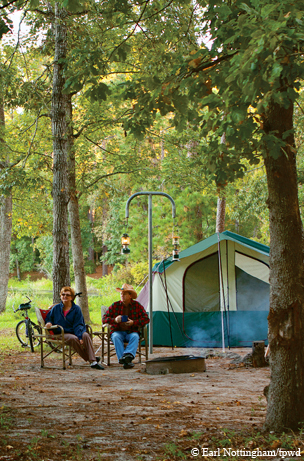 Located at the western edge of the Southern Pine Forest, which extends from East Texas back across the southern U.S. to the Atlantic Coast, Huntsville remains an oasis where you can set aside your Blackberry, unplug from the Internet, step away from your car and breathe deep lungfuls of fresh air. And while the Texas Department of Criminal Justice maintains its headquarters at the storied, deservedly infamous Walls Unit of the Huntsville state prison, the fact remains that for most visitors to the town and the state park that share the name Huntsville, it’s a pretty relaxing getaway. Certainly, the bucolic natural setting was part of what attracted Sam Houston to the area, which was settled initially in 1836, the same year he was first elected the president of the Texas Republic. A lifelong politician who would be twice elected Texas president (in 1836 and again in 1841), who beat Gen. Santa Ana at the Battle of San Jacinto and who also served as the governor of Tennessee (which made him the only American to serve as governor of two states, when he was elected in Texas in 1859), Houston these days is commemorated in Huntsville by Sam Houston State University, the Sam Houston Memorial Museum and Park, where you can visit Houston’s log-hewed home, and the “Big Sam” statue, a nearly 70-foot sculpture of the man that stands overlooking Interstate 45. 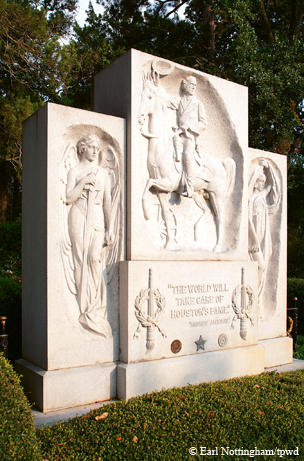 You can also visit Houston’s grave at the historical Oakwood Cemetery at Avenue I and Ninth Street not far from the memorial. For me, these sites offered a chance to brush up on long-forgotten and in some cases never-learned tidbits of Texas history. I had never known, for instance, that as a boy in Tennessee, Sam Houston had run away to live with the Cherokee Nation, and would earn a pair of nicknames — “Raven” as a youngster, and “Big Drunk” once he had reached adulthood. As we now know, Houston eventually managed to straighten up and fly right, and he never forsook his friendship with the Native Americans. As a founding father of Texas, he sought during his Lone Star presidency to keep peace with the tribes. “This is the hub of Texas history,” explains Kimm Thomas, Huntsville’s director of tourism and cultural arts. “But all everybody knows about is the prison.” That may be changing. Thomas notes that the city, which celebrated its 175th birthday in 2010, was selected in 2009 as one of seven official Cultural Arts Districts recognized by the Texas Commission on the Arts. Thomas acknowledges that her job has been simplified by the sheer number of attractions in and around Huntsville. In selecting the town, the arts commission cited events and festivals, historic homes and museums as reasons. In addition to the Sam Houston Memorial Museum, there is the Texas Prison Museum and the new HEARTS Veterans Museum. Back in the state park, I could feel the echo of that last frontier Houston must have encountered when he discovered the piney woods of Texas. The lake that shares his nickname — Raven — is a popular spot with anglers. Birders also flock to the park, which is an upland stop for migratory birds traveling to and from Latin America; 218 species of birds have been spotted in the park or seen in the skies overhead. The forest overstory of shortleaf and loblolly pine provides shade, while creek bottoms across the 2,000-plus-acre state park hold pure hardwood stands of black willow, river birch, water oak and black gum. Nesting bird species include wood duck, turkey vulture, kestrel and many others. The 210-acre lake is also home to a breeding population of alligators — a source of consternation for some visitors. Park officials estimate that there are 40 alligators in the park, the largest of which reach about 12 feet. Though he visits the park frequently, rangy Ken Hilger of nearby Magnolia cannot be counted among those who worry about the gators. A top-ranked mountain biker in the state, Hilger is a part of the Greater Houston Off-Road Bike Association trail crew, and can frequently be found circling the park on his pedal-powered steed. The park has nearly 20 miles of hiking and biking trails, and it’s a short distance from the park boundary to many more miles of trail in the Sam Houston National Forest, including the ever-popular Lone Star State Hiking Trail, an epic stretch of nearly 100 miles of trail maintained by volunteers and the U.S. Forest Service. On the day I join him, Hilger and I are the only two riders in the park, and he makes quick work of the loop that swoops and dips as it darts between the lake shore and the fence line marking the state property boundary. East Texas is not known for its hills, and I’m surprised by the rolling trail. I find myself panting and sweating as we blast over rocks and roots. These days, the Houston mountain bike gang has great plans for the Huntsville area, which is the site of the popular annual Huntsville Classic cross-country mountain bike race. The cycling advocates have teamed up with Houston’s Northwest Cycling Club and state park administrators to expand the trail offerings. The network could increase options for other events as well. Currently, the park hosts two running races for long-distance specialists: the springtime Hog’s Hunt and autumn Rocky Raccoon trail run covering distances of 25 and 50 kilometers — 15 and 30 miles. Huntsville also hosts a pair of multisport adventure races, including the Huntsville Hammer, formerly known as the Texas Jail Break, one of the most popular in the state. Such races involve a combination of biking, running and canoeing. Park Superintendent Chris Holm, a sandy-haired official with a relaxed demeanor who has held the job for five years, says that these races have helped establish Huntsville as one of the Texas Parks and Wildlife Department’s top money makers. Holm is quick to note that even without the “hammerhead” and endurance crowd, Huntsville State Park would be popular — last year, 177,000 visitors enjoyed the park, mostly arriving from Houston and its sprawling suburbs. As part of this year’s TPWD bond to address maintenance issues in 40 public parks statewide, Huntsville is receiving $3 million to make improvements to restrooms, campgrounds, screen shelters and other amenities that Holm says “have been loved to death.” The renovations, including upgrades to the nature center, began in November and are expected to continue through April 2011. I was happy to hear of these enhancements, and they will provide me with an excuse to return to the park. After two days of exploring, and a hard bike ride, I was looking forward to meeting Kimm Thomas for dinner. She had chosen the Homestead on 19th, an eatery that occupies one of Walker County’s oldest original homes, a sprawling East Texas log cabin built in the 1830s. The restaurant is across the way from the Sam Houston Memorial Museum and around the corner from Sam Houston State University. Sitting on the porch with the leaves flickering in the breeze and the sun setting, I was impressed with how urbane this spot seemed considering the country-fried atmosphere I had been enjoying all day — and that was before I got to the meal. 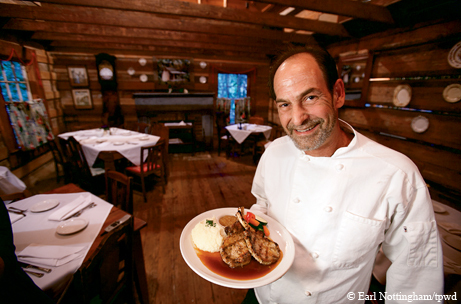 The chef and owner of the Homestead is John Eschenfelder, a veteran of Dallas’ famous Mansion on Turtle Creek, who toggles between Cajun and Texas specialties and continental cuisine with a French flair. I dug into a sumptuous steak while Thomas enjoyed the seafood special. When Eschenfelder stopped by our table to check on our progress, I asked him if he had any misgivings about quitting the Big D for Huntsville. “It was an easy decision,” he smiled. I could see why. But I still had miles to go on my Huntsville tour. Rather than stick around town, I took Thomas’ suggestion that I roll up to the shores of nearby Lake Livingston for my final night. And so I made my way to Bethy Creek Resort, an old fishing camp that, in an effort to keep up with the high-adrenaline pursuits preferred by kids these days, has been transforming itself slowly but surely into one of the region’s top wake-boarding destinations. My nighttime arrival deprived me of an initial chance to examine the resort’s ongoing face-lift, but with my vision filled with a million stars above, I felt sated. The next morning I catch up with Randell Vincent Jr., known far and wide as “Junior” (I meet his semiretired dad later in the Bethy Creek bait shop), who gives me the lay of the land and the lake. There are shaded campsites for tents and RVs, a modest motel-and-cabin complex where families gather, a boat ramp, fishing pier and more. “Lake Livingston is the heart of our recreational resource,” Vincent says, noting that while his family has decided to chase the elusive dream of training X Games wannabes, it’s still the fishery — including largemouth, striped and white bass, as well as crappies and cats — that gets most of the attention on Livingston. And in spring, when the white bass run, he says, it’s a bonanza. Before I check out, I work my way down the fishing pier and boat dock, hoping that some unsuspecting somebody might take a spinning lure on a slow retrieve. But even while I have the picturesque shoreline to myself, I don’t find much action; I blame the slow fishing on the bright sun overhead and stop to see if a blue heron I have spotted in a nearby cove might be able to teach me a thing or two. He waits by a submerged boulder, and with a lightning-fast stab he retrieves a small perch from the lake. At lunch, I find my own hunger satisfied with a tailgate feast of succulent smoky sausage and sweet tea. Scavenger that I am, I purchased the meal at Tallent’s Grocery on Vincent Sr.’s strong recommendation, and my make-do picnic reaffirms my feeling of kinship with the man the Cherokee called Raven. Passing Big Sam on my way home, I offer my thanks that Huntsville today retains many of its authentic charms.